In recent years, three woodworkers died and several were seriously injured while assisting a skidder operator on a conventional logging operation. In each instance, the skidder operator had started to winch the load while a co-worker was still in the area. 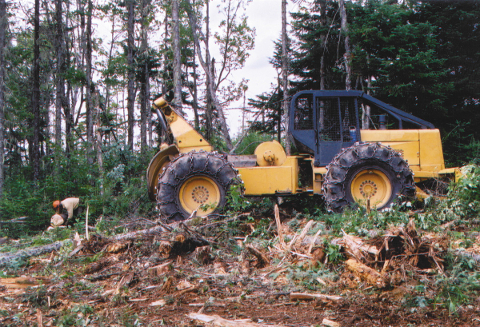 During a winching operation, trees are pulled toward the skidder and can become snagged or pulled up against another tree, a stump or part of the skidder. Tension builds on the winching cables and the logs can either swing out to the side, or over the skidder, striking anyone in the area with a very strong force. These incidents can be prevented by following some simple precautions. Anyone assisting a skidder operator should ensure that they are positioned at least twice the distance away of the longest log. The operator does a full-circle or 360 degree check before engaging the winch. Always install chokers as close as possible to the end of the trees being winched. Employees should wear high-visibility apparel such as an orange hardhat and a reflective vest. Take special precautions when working in select cut operations. This situation is inherently dangerous because of decreased visibility, greater risk of logs binding up against standing trees, and a false sense of security that other standing trees offer protection. Identify any hazards and take appropriate measures to ensure the safety of everyone working in these types of operations.